All votes are being tallied and results will be posted shortly. Once again the Hulen Stone Crossing HOA’s Board of Directors were successful in efforts to hold a community Block Party. Held May 21, 2016, there were hot dogs and water donated by the local Kroger’s store, bounce house and slide, and door prizes. Neighborhood Police Officer Frank Tenorio and colleagues also attended and were happy to mingle and speak with residents. Kids and parents alike enjoyed themselves! 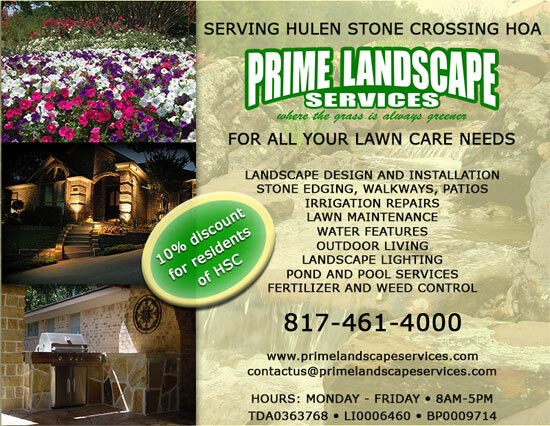 Congratulations Hulen Stone Crossing HOA!!!! A perfect balance of life and play! Hulen Stone Crossing is an exclusive, master-planned community featuring beautiful homes in the Crowley ISD. It's nestled south of downtown Fort Worth and just driving minutes from DFW Airport and major metropolitan areas. Residents in this community are in close proximity to top-rated schools, major business routes, fantastic shopping opportunities, and a wide choice of entertainment close to home. Assessments are due quarterly: January, April, July, and October at the first of each month. The quarterly amount is $127.50. It is important to pay on time to avoid late fees and interest. If you see what appears to be an irrigation break with water flowing for hours, or some other type of HOA emergency, please be sure to call the HOA’s Emergency Dispatch Service, answered 24 hours a day/7 days a week. Please be prepared to provide as much information as possible so that emergency crews can locate the problem quickly. Sign Up and Be Notified!